Dare Greene had always had a crush on Kathy Parrish, but he'd never acted on his feelings. He'd always known that nothing could come of it. She was brilliant, and he was ordinary. Even worse, he felt dumb in comparison to her, and his family. His parents and brother all had gone to college, and had extensive degrees. He'd simply worked hard and started his own business. His family never indicated they were disappointed in him, but he couldn't help his feelings. He couldn't read - couldn't even spell the name of the diagnosis, and he definitely shouldn't act on his feelings for Kathy. But Kathy was wearing spots. Suddenly, Dare had this insane overwhelming fantasy of Kathy in spots. Was she wearing spots under her shirt? When she proved she was, there was no holding back his desire. But this couldn't last. Dare was smart enough to know that Kathy would never settle for someone like him. Kathy had always had a crush on Dare. He'd been a jock, while she'd been the nerdy girl who studied him as much as her homework. She knew he had dyslexia, but that didn't make him dumb. The fact that he'd built such a successful business in a short time was inspiring. She knew Dare couldn't be interested in her. He never had been. But he had seemed interested in her shirt. Was it the spots? She couldn't stop herself from testing that theory, and suddenly, Dare and Kathy were seeing spots... everywhere. 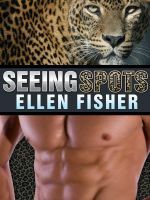 Seeing Spots was a fun romance between two people secretly attracted to each other, and finally acting on those feelings. Dare can't explain his obsession with spots, but he knows that he wants to see Kathy surrounded by them, wearing them. He doesn't need to explain his obsession with Kathy, that'd been festering for years. The passion burns fast between these two, but the romance is slow, and steady - certain to sustain years of love together. They are simply the perfect mates for one another, as they are soon to find out.